I live down the street from a major mall, so believe me when I tell you it’s holiday shopping madhouse out there. I’ve been avoiding it like the plague, preferring to do all my shopping online instead. There are a couple of people on my list that I think will love some Korean beauty treats, so I thought this would be the perfect time to catch up with Alice, owner of my favorite online Korean beauty shop, W2Beauty.com (W2Beauty= Welcome to Beauty). I’ve been curious about what the shipping deadlines from Korea will be if I want my gifts in time for Christmas, and I also wanted to know what kind of gift sets are available from Seoul these days! 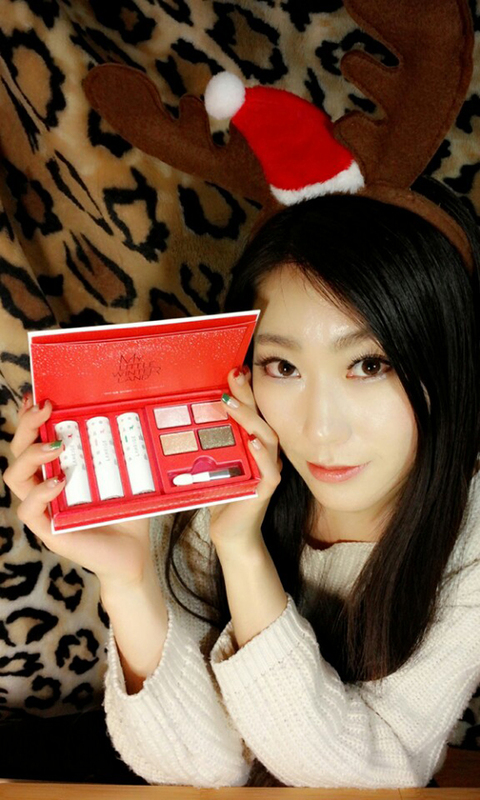 Alice is holding the limited edition Laneige Winterland Magic Makeup Collection. Also, can we just take a moment to admire how flawless she looks? I’m loving the eye makeup and the Christmas mani. Kerry: Gift sets and limited-edition holiday makeup releases are a big deal around Christmas time in the US. Are they a big deal in Seoul as well? We also receive gifts from the Cosmetic brands for Christmas hehe 😀 (to thank us for shopping with them – I believe they offer the gifts to some faithful customers and well… since I’m shopping with almost all of them, that also means lots of gifts for me! Yaaaaaaaayyy :p haha). Kerry: What are some of the must-have sets for the holiday? Alice: Laneige Winterland Magic Makeup Collection ($52) is really…really cute and pretty and it has all the useful colors, that’s definitely THE set I would recommend you to get ;p It could really be an excellent gift as well, actually! Also I fell in love with Innisfree’s Sweet Vanilla Diffuser ($26). I put one on the bed. Before I sleep, I use that as aromatherapy. Kerry: Are any of the sets or limited-edition items selling out? Which ones are the most popular right now? Kerry: What kind of Korean cosmetic gifts would you suggest for someone buying for a friend who’s never tried Korean skincare or makeup before? Alice: For Skincare, I would most definitely look at the Missha Time Revolution Best Seller Set ($106) ! It is a safe and great gift ;p – 100% sure to make the lucky loved one happy! If you are on a tight budget but still wish to make a good gift of skincare, you can think of Benton’s products; Kerry has made great reviews on them and it is actually among my best sellers in my shop! Since it’s winter, you can even get some hand creams as well! We all need some. For the special occasion, the Limited Edition Innisfree Hand Cream Set ($19) would be an excellent choice 😀 ! And the packaging for it is really cute, so that is a natural gift choice. Concerning the makeup, you can be sure that the one receiving Laneige Winterland Set will be speechless and really, really, happy ;p .
If you are on a tight budget, you can get some lip tints! Tins are usually better than lipstick or lip gloss because it doesn’t wear off that easily. I’m thinking of either the A’pieu kissable liptint or Etude House Dear Darling Tint AD. Recently, Peri’s Tint ( from Clio-Peripera) are also selling remarkably well, hehe. Kerry: What about someone buying a skincare gift for their mother or grandmother? Once again, Missha has some “ready” gift sets that makes them really good as gifts! I can even help you pack them nicely so that you can offer them directly! :p If you wish to do this, you definitely need to take EMS while ordering with me, otherwise the package may not arrive on time for Christmas. Kerry: If I live in the US, what is the latest I can place my order and still have it arrive in time for Christmas? What about Europe and Australia? However, with EMS, you can still pass your order this weekend (through Sunday, December 15th)and receive the package before Christmas : ) I will do my very best to work the extra time to get all the shopping done ! Kerry: Will you be picking up any gift sets for yourself? Alice: I actually got quite a few already haha 😀 I got one Innisfree Sweet Vanilla diffuser for myself. I already put that in my room and I love it. Before sleep, it makes me feel so comfortable and relaxed. How I can say.. It makes me feel special. Also the fragrance just comes to whole my body so I don’t need to wear perfume nowadays, haha. Even my boyfriend loves it, too. I also got the Laneige Winterland set, I’m not really using it yet but well … I really couldn’t resist .. .haha. Kerry: What are you Christmas plans this year? 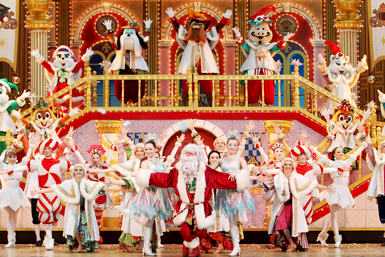 The Lotte World Christmas Party (from the official Lotte World Website). I looked it up when Alice mentioned it, and now I feel like my life will be worthless until I see this party in person! I plan to open a small Christmas party at a café with my friends on Christmas Eve. Funny Rudolph and lovely Santa are ready, haha. Ohhh And I plan to work on Christmas as well haha :p so don’t worry … you can still pass your order on Christmas and I will even make it a SPECIAL DAY ☺ I reveal my plans for the shop to you here as an exclusive news but I will be offering you a special gift for your orders on Christmas ☺ I‘m still making the preparations and seeing what’s possible, but count on me 😀 At the very least, you would get more than usual ,hihi! PS: For the special occasion of this interview with Kerry, I even made a video haha. This is my first time doing so, and I hope you will like it. I do plan to make a lot more in the near future! Hope you will guys will subscribe to my channel. Thank you so much for your support everybody ! Editors note: First time W2Beauty customers get a $5 voucher by entering my sponsor code at sign-up: 025605. If there’s something you want but don’t see, be sure to drop Alice an email and let her know. She’ll be happy to get it for you! Oh, and don’t forget to subscribe to Alice’s YouTube channel. You’ll stay up to date on all her future videos, and she also features a lot of Korean commercials for popular beauty products! Which of these gift sets are you most excited about? Alice is too adorable! I love how festive the packaging is! Me too, Kira – I especially like the artwork on the Laneige set. Awww..that’s so sweet doing many things for your loved ones. One thing that perks my interest is the Vanilla diffuser..
How does it work?Just placed it anywhere? Hi Mizuchan! The Vanilla diffuser looks similar to one I have. The one I have is a little glass jar filled with scened oil. There are reeds in the glass jar that soak up the oil and the fragrance coming off the reeds fills the room. I’m interested in this Innisfree one too! Nice interview. ^_^ I always love to hear about gift sets from Korean brands. For some reason, I’m not great at tracking down info on them myself. Me too, Bethany. I love the way they’re all packaged! Lovely interview! Now I want to go to Lotte World’s Christmas party too. I swear Alice looks really similar to Bora from Sistar (a Korean idol). I’m a sucker for holiday packaging or anything Christmas-y, so I’ve already bought a few of the items Alice mentioned. Thank you for the interview Kerry! I always love reading them. Although now I’m thinking about how boring my Christmas is going to be compared to those who go to Lotte World’s Christmas party.